Sister Vera Krass went home to God on October 14, 2015, early in the morning in the Maryknoll Sisters Center, where she had been living since 2008. Vera was born on Aug. 22, l927 and recently celebrated her 60th jubilee as a Maryknoll Sister. Vera’s parents, Theodore Krasowski and Lydia Loffler migrated from Germany and settled in New York. At the time of obtaining their American citizenship, they changed their name to Krass. Vera’s parents and her one brother, George, have predeceased her. Vera graduated from Richmond High School third in her class with High Honors. She continued her education at Wittenberg College, Grailville Community College, and Maryknoll Teachers College. All her records indicate superior scholarship. Along the way, Vera had become a crackerjack secretary, and had even received a Shorthand Teachers Certificate from the prestigious Pitman College in London, UK. On November 1, l950, Vera, then 23, was baptized into the Catholic Church and thus began her journey to Maryknoll. She entered five years later in l955, made her First Vows in the Center in 1958 and was assigned to Tanzania in 1960, where she made her Final vows in l964. In Tanzania, Vera served in Rosary College, Mwanza, Marian College, Morogoro and the Shinyanga Commercial School. 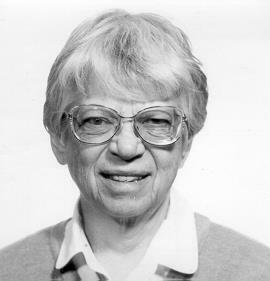 The Regional Superior wrote of Vera, “She was one of the pioneers of the new school and had a nice manner with the girls.” In all of these assignments, Vera, a perfectionist by nature, was conscientious and diligent in everything she did. However, she was not without the gift of a kindly humor, as Mother Mary Joseph set as a requirement for her Sisters. She could enjoy a good laugh with her Sisters. In l970, Vera was called to work as secretary to the President, Barbara Hendricks, until l973. Here she was described as an accommodating, relational person. She took courtesy to another level, courtesy beyond courtesy! She seemed to respond to each one with what was in her heart. Vera was a wonderful correspondent and she frequently wrote affirming letters to the Central Governing Board (CGB) members and later Central Leadership Team (CLT) members. So it is no surprise to learn that as her prayer ministry, Vera chose the CLT. In l973, Vera began studies at Maryknoll Seminary and was awarded an MA in Theology in l974. She returned to East Africa the next year and was asked to work as Executive Secretary of the Association of Member Episcopal Conferences in Eastern Africa, AMECEA, until l980. In her effort assisting the local church, she aided Bishop Vincent Joseph McCauley and supervised staff members. Those of us who knew her at this time knew how Bishop McCauley praised her, as did the staff; all were amazed at the work she did. The next year, Vera did pastoral work in Musoma. It was at this time that Sue Rech was alone in Kijungu, Maasai land, an isolated village 250 km south of Arusha. Vera volunteered to go and stay with Sue. Sue wrote “She was out every day walking around in the village, greeting the Maasai women and the agricultural women, teaching religion, reading and writing.” Shortly after, they both left as the mission was closed for there were no other Sisters able to go. However, over the years, when Sue traveled to Maasailand, many people there would ask about Vera. They wanted Vera to come back for a visit. One of the elders, Mbatian, asked about her recently and sent a piece of cloth he wanted her to have. Vera was delighted when she received the gift and said that her time in Kijungu was one of the happiest of her life. Clearly, it was a happy time for the people of the village as well. Four years later, she returned to the Center and did work in computer services. In l991, Vera was assigned to the Central Pacific Region in Honolulu, HI. Here, Vera advocated for the prevention of child abuse and neglect at the Hana Like Home Visitor Program. She also worked with women and children at the Homeless Solutions Transitional Shelter. In Hawaii, people remember Vera for her sensitive concern for others. Indeed, upon learning that one of our sisters from Tanzania received news of the death of a family member, Vera immediately rushed with her khanga, to comfort her in traditional African style, gentling the pain of her loss. When Vera’s eyes began to trouble her, she moved to Monrovia, CA. There she is remembered for her many activities. She enjoyed meeting new people and was hostess at the annual Boutique Brunch. She included her own sisters in her outreach helping and mentoring new arrivals to Monrovia. She knew and kept up on local history and news and kept all informed. Vera was an active member of the Duarte Senior Center. She was ever alert to the many excursions and events and took the sisters along for the day. She loved being a tourist guide. One sister recalled that Vera even pointed out where John Wayne was buried in a crypt in the LA Cathedral. Vera even tried theatre. She was a walk on actress in the movie SECRET SANTA and was quite good. Vera returned to the Center in 2008 where she joined the Chi Rho Community. She wrote, “I desire more time for prayer and also I would like to be a companion to older sisters, especially those who mentored me in Tanzania,” specifically mentioning Sr. Margaret Rose Winkelman. In 2010, Vera joined the Eden Community where she is fondly remembered for her role in Mollie’s Circle where she greeted guests and new members and gave the sisters up-to-date Maryknoll news. In her last years, Sister’s eyesight became dimmer and she spent her days quietly. She welcomed guests and enjoyed visits. Her family in Germany, ever faithful, telephoned her every week. We welcome our Maryknoll brother, Father Francis Breen, who worked many years in Africa. He will preside at our Eucharistic Liturgy of Resurrection.